As Andrea Eidinger reminded us in her recent post on the changing nature of poppies and Remembrance Day, the poppy has been central to Canadian commemorations of wartime sacrifices since its adoption ninety-seven years ago. Despite this ongoing effort to remember, the iconic red flower’s history is often taken for granted, its early years almost completely overlooked. Even the Canadian Legion’s literature recalls only that “the Great War Veteran’s Association in Canada (our predecessor) officially adopted the poppy … on July 5, 1921.” What is often forgotten is that the poppy’s history began to work its way into Canada’s commemorative ether even before war’s end. The flowers were grown in Canada, planted on Canadian graves, used in wreaths, and, by the early 1920s, worn on lapels. Dubbed “flowers of remembrance,” they drew inspiration from John McCrae’s famed poem and were embraced as a symbol to remember the war’s dead. But to wear a poppy in the war’s aftermath meant more than just remembering Canada’s fallen. Interwar-era lid of a Vetcraft poppy box. Source: Canadian War Museum, “Remembrance Day Commemorative Print” (c1920s-1930s), Object number: 19940057-001. Accessible online here. Early campaigns stressed that buying the artificial flowers supported veterans facing economic hardship. It was no idle concern: unlike the men and women who returned after the Second World War, no post-war boom welcomed the veterans of 1914–1918. In its place were a failed bonus campaign, labour strife, and a gruelling fight for pensions. With the economy in recession, the stakes for selling poppies were high – so high that their sale would become embroiled in a scandal that wound its way to the Canadian Senate. Between 1921 and 1926, these blood-red flowers had come to stand for more than remembering the war’s sacrifices. They were a potent reminder that the “square deal” veterans fought for had not yet come to pass. In the spring of 1918, Percival Mitchell, president of Toronto’s horticultural association, recognized the symbolic ties between poppies and the country’s war dead: “No Canadian who has ever read ‘In Flanders Field’ [sic] will ever look at a poppy again without thinking of the graves in Flanders.” He was not alone. Canadians across the country embraced the poppy for its symbolism. That April the Globe even declared that the famous flower was the “one real rival to the Maple Leaf as a possible national emblem.” With the Armistice signed, Canadians began linking the flower to concepts of victory and peace. Hugh Ritchie’s poem “Victory,” was typical. It concluded: “The fight that ye so well begun / Is finished now and nobly won. / So ’midst the poppies sleep in peace / In Flanders Fields.” By the early days of 1919, communities across the country began to consider whether poppies were a fitting way to commemorate the war. An early use of the flower to honour the memory of those who died in the conflict was to plant “Flanders Poppies” in Canadian soil. St. Thomas and Chatham, in southwestern Ontario, were some of the first towns to commit to the plan, although horticultural societies cautioned against widespread planting for fear that the poppies would become a “noxious weed.” Ontario’s agriculture minister (and a future premier), George S. Henry, raised similar concerns. Planting poppies may have appealed on “sentimental grounds,” but their seeds could threaten grain fields. The provincial minister preferred trees “in memory of the men who have fallen.” So concerned was the Vancouver Sun about a poppy infestation that it warned those who considered ordering seeds from Flanders “should be hanged, drawn and quartered.” Little wonder that the idea did not take hold. Although the transplanting of poppies was not to be, the flowers soon became a common way to mark Canadian graves. As the Globe reminded its readers, poppies could be used to honour Canadian sacrifices to demonstrate that “those who lay sleeping beneath the poppies had not given their all in vain.” In July 1919, Charles Garwood, a skilled gardener who had enlisted in 1914 with the Princess Patricia’s Canadian Light Infantry, exhibited a floral “Peace Display.” Its central feature, as reported by the Ottawa Citizen, was a white wreath of approximately 5,000 flowers, which surrounded a vase of poppies placed “in memory of the boys who died ‘over there.’” In Toronto, 25,000 people gathered at Prospect Cemetery to decorate soldiers’ graves. The tributes included a six- by three-foot display depicting a white cross and poppy-covered ground. “Gone, but not forgotten,” read its inscription. By 1921 the poppy had made its way from gravesides to wreaths and then to lapels. Most accounts credit Anna Guerin with introducing the idea of selling artificial poppies to the Great War Veterans’ Association (GWVA). But she was not the only one to suggest their sale. The Imperial Order Daughters of the Empire (IODE) also considered a similar use for the flowers that June. At the Toronto meeting of its national chapter, the order proposed poppy sales to raise funds for a war memorial. Although the IODE preferred the symbolism of the maple leaf over that of the poppy, the idea of using the flower to commemorate the war was clearly en vogue. 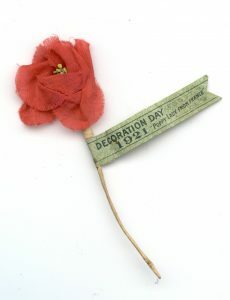 A US poppy from commemoration for Memorial Day in 1921, known as “Decoration Day” at the time. Canadian poppies used a similar design. Source: Canadian War Museum, “Poppy” (1921), Object number: 19720228-001. Accessible online here. For the GWVA’s first Poppy Day, the artificial flowers were provided by Guerin and manufactured by the “women and children of France.” Demand for large and small poppies, used in wreaths and for pinning on a coat or jacket, increased the next year, and the association sourced its poppies from a Toronto firm. In expectation of even greater success in 1923, the GWVA partnered with the federal government to manufacture poppies. Production was carried out by the Department of Soldiers’ Civil Re-establishment (DSCR) Vetcraft shops, one of the few direct employment schemes operated by the federal government (sometimes in conjunction with the Red Cross) to employ disabled veterans who were otherwise unable to re-enter the workforce. In the early 1920s, veterans working in these shops constructed household items such as vases, desks, chairs and, from 1923 onwards, poppies. Vetcraft shops were involved specifically in poppy making to assist disabled veterans. According to the Ottawa Citizen, the cheapest way to acquire and distribute the commemorative flowers was to rely on private enterprise, but the GWVA decided in 1922 that it wanted to partner with the DSCR to manufacture poppies, even if it cost more. The price of the vetcraft poppies may have been higher, but “the great majority of communities have willingly agreed to pay a greater price for their supply in order that the entire proceeds from the poppy distribution may be utilized to good purposes and not be devoted in part to private gain.” So keen was the association to support Canadian veterans that it turned down an opportunity to buy discounted poppies from the United States – a fateful decision that may have avoided a potential scandal. The American-sourced poppies were leftovers from Memorial Day and were supposed to have been manufactured in France, likely by the same widows and children supported by Guerin. It turned out, however, that the poppies had actually come from Germany. When their source came to light, newspapers jumped on the fact and denounced the “German” poppies while simultaneously praising the GWVA for supporting Canada’s wounded veterans, especially vetcraft workers. To remember the sacrifices of Canadians. By committing solely to vetcraft poppies, the GWVA not only ensured that wounded veterans would receive continued employment, but it also added an incentive for Canadians to support poppy sales. While rival ex-soldier associations spent much of the early post-war era in-fighting and arguing over which was the rightful voice of Canada’s returned men, there was no disputing that the GWVA led the charge among the various veterans’ groups to distribute poppies. By collaborating with Guerin, the association quickly established itself as the de facto organization dealing with these flowers of remembrance. The 1923 agreement with the DSCR continued the trend. Competing organizations largely agreed to support the proposed plan because it was a win-win scenario. Vetcraft shops would gain additional orders, and profits from the sale of their poppies would be transferred to ex-soldiers (or their dependents) in need of assistance. Furthermore, nothing precluded other veterans’ groups from selling poppies; they just had to agree to sell them at the same price as the GWVA. Since all proceeds would assist veterans, the various ex-soldier associations were thus free to concentrate on selling poppies in the lead-up to 11 November. Estimates for 1923 suggest that slightly more than 1,000,000 poppies were sold; that number more than doubled in 1924. The GWVA’s poppy campaign seemed to put into practice what Baron Byng, the governor general, had declared during his 1921 Armistice Day message: “Honor the dead by helping the living.” But while there was peace on the poppy front, the veterans’ groups continued to fight over how to assist returned men. Rivals of the GWVA complained that Ottawa favoured the association, and they challenged the use of canteen and disablement funds to pay for a GWVA office to assist ex-soldiers. Soon the dispute over this “adjustment bureau,” as the office became known, expanded to include the GWVA’s poppy sales. When the debate about the association’s handling of veterans’ issues reached the House of Commons, a Senate committee was called to investigate. 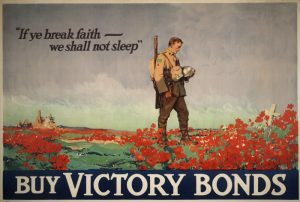 A wartime Victory Bonds poster, variously dated, but possibly from as late as 1918. 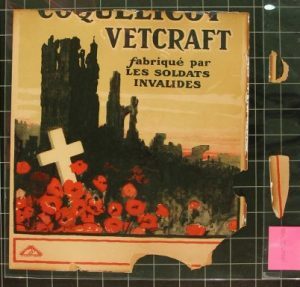 Though in the public domain, this image (accessible here) is of a poster held in the Toronto Reference Library’s Baldwin Room, and is part of a donation by John McCrae, who died on service in France in 1918. Chaired by N.A. Belcourt, the committee addressed rumours that the GWVA was mismanaging funds intended for the assistance of veterans, including allegations that it maintained a monopoly on the poppies produced by the DSCR and, worse still, that it was profiting from their sale. The association denied any wrongdoing, but the senators found otherwise. Their report, published 18 June 1925, was damning. It accused the GWVA secretary, Grant MacNeil, of breach of trust, and on the poppy question the Senate determined that there was a “quasi exclusive privilege” afforded to the GWVA to sell the artificial flowers in Canada. It also found that “the commercialization of the sale of these poppies” had taken place and ordered that the practice be eliminated. MacNeil and the GWVA maintained that any money raised from the sale of poppies supported the association’s wider goals of assisting Canada’s veterans, but it did not matter. With its reputation irreparably tarnished, the GWVA joined with other veterans’ groups at a unity conference to form the Canadian Legion of the British Empire Service League. The association’s fifth poppy campaign would be its last. It is unlikely that MPs and senators shed a tear for the GWVA as it faded from the scene. Its advocacy for veterans had been a thorn in the side of successive federal governments, and while Belcourt’s report recognized the symbolic power of the poppy (“The wearing of a poppy on Armistice Day has become a custom upon patriotic and sentimental considerations.”), its findings did not address how the manufacturing and sale of poppies helped employ and assist veterans. To do so would have given credence to the GWVA’s demands for the state to increase assistance for Canada’s veterans. Sales of Canada’s flowers of remembrance continued to increase in 1926, the first year the new Canadian Legion organized the campaign, which continued to play up the flower’s dual symbolism of remembering the fallen and employing the wounded. By that point the selling of poppies in the lead-up to Armistice Day had become a well-entrenched tradition, one in which millions of Canadians took part. Although the sale of these “flowers of remembrance” has taken on different meanings over the decades, it should be remembered that this tradition is rooted in an effort not only to commemorate, but also to assist those who do not lie in Flanders’ fields. Jonathan Scotland holds a PhD in Canadian history from Western University. He works for the Dictionary of Canadian Biography at the University of Toronto. Ottawa Citizen (7 November 2018), https://ottawacitizen.com/news/local-news/public-interest-in-remembrance-day-still-strong-after-100-years. Eidinger’s post appeared first on her Unwritten Histories blog. [Toronto] Globe (16 April 1918), 7. Globe (18 November 1918), 4. Globe (31 January 1919), 3. Regina’s The Leader (15 February 1919), 28. Vancouver Sun (24 January 1919), 6. Edmonton Journal (8 February 1919), 17. Globe (11 November 1919), 3. Ottawa Citizen (21 July 1919), 2. Globe (26 July 1920), 9. Vancouver Sun (4 June 1921), 3. Regina’s The Leader (5 July 1921), 7. On vetcraft and the Red Cross see Sarah Glassford, Mobilizing Mercy: A History of the Canadian Red Cross (MQUP, 2017), 176-77. Edmonton Journal (30 September 1919), 6. Regina’s The Leader (6 November 1924), 8. Ottawa Citizen (6 November 1923), 11. Regina’s The Leader (11 November 1923), 4. Winnipeg Tribune (11 November 1921), 2. Peter Neary, On to Civvy Street: Canada’s Rehabilitation Program for Veterans of the Second World War (MQUP, 2011), 23; Desmond Morton and Glenn Wright, Winning the Second Battle: Canadian Veterans and the Return to Civilian Life, 1915–1930 (UTP, 1987), 196–99. Senate of Canada, Reports and Proceedings of the Special Committee Appointed to Inquire into the Administration of the Canteen Fund and the Disablement Fund and the Manufacture and Sale of Paper Poppies (Ottawa, 1925), 14. Calgary Herald (13 October 1925), 4. Nanaimo Free Press (07 November 1925), 1. Ottawa Citizen (10 November 1925), 1.